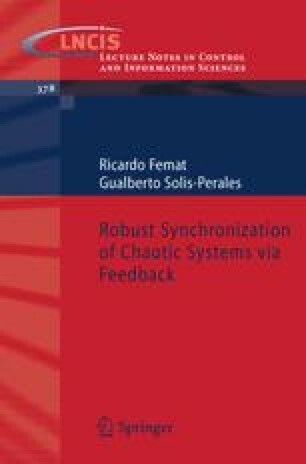 Now a discrete-time approach to feedback controller is discussed to control a particular system which describes a friction phenomenon. This system is used to introduce some features of the discrete time controller for chaos control. The friction system comprises some interesting dynamical properties, e.g., an invariant manifold characterized by zero velocity and velocity direction. Such properties allow a practical justification of the feedback design, which yields control of the measured state and its time derivative. The mechanical justification and the feedback design allow us to introduce the synergetic interpretation. Here the self-organization of a simple dynamical system is discussed from the understanding of the effect of control parameters acting over mechanical systems. The control parameter is yielded by the so-called controller. The controller is a feedback scheme from a finite-differences approximation. Such justification leads us to develop a chaos suppression scheme. The main idea is to counteract the nonlinear forces acting onto (or into) the systems and compensates the external perturbation forces acting over the nonlinear systems. The goal is to compute an estimate value of the uncertain force in such way that nonlinear systems can be controlled. This is, the synergetics of the second-order driven oscillators is studied from the point of view of the control theory. In principle, the finite-difference is able to achieve chaos control and synchronization. In addition, we shall see that a discrete time approach feedback attains synchronization against master/slave mismatches. Indeed, the procedure yields synchronization of strictly different oscillators. In this sense, it is said that controller is robust. This means that self-organization of this class of oscillators can be achieved in spite of master/slave mismatches (even if oscillators are strictly different). We belief that synergetics is due to feedback structure into the nonlinear system.